There are a lot of factors that need to be considered when designing an emergency communications system. But above all, these systems need to be designed with one goal in mind: getting the message across. No matter what the layout of the facility or the nature of the message, the message needs to be understood by the facility’s occupants. Otherwise, they may not get vital information, or may not be able to take the necessary action in response to the current situation in the facility. In this week’s blog, we’ll talk about the basics of designing an emergency communications system that gets the message across. Above all, emergency communications systems need to be designed with one goal in mind: getting the message across. 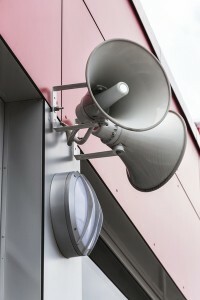 Emergency communications systems can utilize either a live speaker or a prerecorded speaker. Generally, prerecorded messages are preferable for a number of reasons. Live speakers can be unpredictable and may unintentionally garble the message. Prerecorded messages can be tested for quality control to ensure that when the time comes, the message will be intelligible. The STI is on a scale from 0.0 to 1.0. NFPA 72 requires an STI of at least 0.7, in which 95-96% of sentences spoken from an emergency communications system will be understood. Software is available that allows you to input the parameters of your space and generate the potential STI. However, these should only be used if you have a solid understanding of acoustics. Spaces that may not require message intelligibility from an emergency communications system include private bathrooms, storage rooms, closets, individual offices, equipment rooms, elevator cars, kitchens, or rooms where intelligibility cannot reasonably be predicted. This entry was posted on Thursday, June 18th, 2015 at 1:39 pm. Both comments and pings are currently closed.